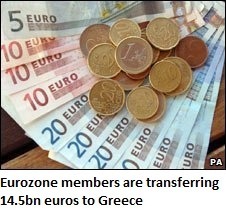 Greece has received the first tranche of an 110bn-euro ($136bn; £94bn) loan to help it overcome its debt crisis, the European Union has said. The European Commission said 20bn euros from the EU and the International Monetary Fund had been drawn on. The bail-out package for Greece – which has an 8.1bn-euro bond repayment due on Wednesday – was agreed earlier in May. On Monday, eurozone finance ministers insisted the euro was still credible despite its slide against the dollar. The European single currency fell to its lowest level against the dollar since 2006, amid concerns that debt problems will undermine Europe’s recovery. On Tuesday it recovered some ground but remained under pressure, trading at $1.2335. It was broadly unchanged against sterling with one pound buying 1.165 euros.